Constance successfully became an ordinary person. People warned her it would be boring, and they were right. That's exactly why Connie loves it. But there's an Adventurer-shaped hole in the cosmos now and a lot of interested parties eager to fill it. Not all of those candidates are fit for the role, and if the Adventurer falls into the wrong hands, it can lead to chaos and destruction. When the fate of the world is at stake, Constance sets off, reluctantly, to keep the forces of evil from stealing the destiny she abandoned. In general, I find sequels disappointing, particularly when the book they follow relied on some kind of gimmick. 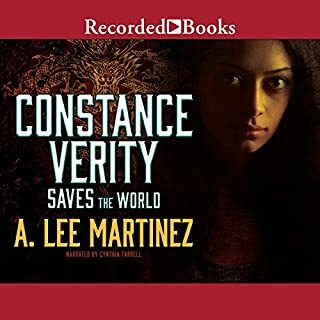 I was concerned that a second Constance Verity book would suffer from the fact that so many "epic hero" stereotypes had already been mined by the first book, and was pleasantly surprised that Martinez was able to continue the entertaining action without feeling like he was digging for scraps. Would you listen to In The Darkness, That's Where I'll Know You: The Complete Black Room Story again? Why? Probably not, because I pretty much never listen to anything twice. I thought the premise was novel and the plot was well constructed. The world the author constructs is interesting, and discovering it along with the characters makes for a compelling read. 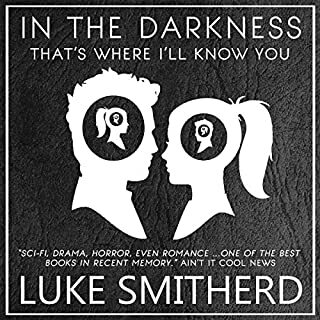 What does Luke Smitherd bring to the story that you wouldn’t experience if you just read the book? The author does a nice job reading his own book and his accent fits nicely with the book's location. One, and unfortunately it wasn't in a good way. The fourth act gets a little too cringeworthy for a moment, but not enough to ruin the book. The author acknowledges in an afterword that he actually toned down that section, and I can see why. One thing I found surprising and maybe a little disappointing was the ending. The ending works and is a decent choice, but without giving anything away all I can say is that there are some story elements that the author introduces but never returns to, and they could have been used to come to a very different (and, in my mind, slightly superior) resolution. That said, the book was both entertaining and satisfying. I'll definitely be listening to more of his work (particularly if he reads it himself).